Colonial Tire & Automotive has specialty tires for your lawn and garden equipment. Get the BEST PRICES on lawn mower tires, golf cart tires, and ATV tires when you visit our tire shop in Durham, North Carolina. Call (919) 544-1723 for a competitive price quote. We look forward to keeping you rolling during work and recreational activities with some of the best brands on the market. We serve the specialty tire needs of customers across Durham, NC, Morrisville, NC, Cary, NC, and the surrounding communities. When it comes to taking care of a commercial or personal property, the type of lawn and garden tires you choose is indispensable. They're the difference between a nice lawn and an unintentional construction site. At Colonial Tire & Automotive, we know just what you need - lawn mower tires that glide over the ground instead of tearing it up, and push mower tires that don't resist you. Overly worn tires won’t work as well, and tires unable to support the weight of your lawn mower are dangerous. A tire’s ply rating will inform you of how much weight it can support. The larger the ply number, the more weight the tire can hold. Both small and large ply ratings have their benefits. Check with our team to determine the best tire for your application. Turf or Street Tires: Common on golf carts without modifications. These tires are made for golf courses and smooth paved roadways. Knobby or Off-Road Tires: These tires have a distinct tread pattern designed to navigate terrains such as mud, sand, and wooded areas. All-Terrain Tires: In between turf and knobby tires. All-terrain golf cart tires provide a smoother tread than knobby, yet a more aggressive tread than turf tires, This allows your golf cart to ride on many terrains. All our golf cart tires come from respected manufacturers, so you can rest easy knowing you're getting a quality tire whenever you need one. As always, we boast the best tire prices on everything in out inventory. Colonial Tire & Automotive has the tires you need for your next ATV adventure. 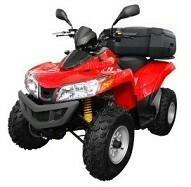 Ride through mud and sand or take on wooded trails and coarse motocross tracks. Your all-terrain vehicle is able to go virtually anywhere with the right tires.